Even though a number of special, pre-event sessions and activities will take place on Monday, official badge check-in itself WILL NOT be open Monday. Some of the activities are exclusive to journalists and bloggers, non profit organizations and marketers. Official badge check-in opens Tuesday and will be open daily through Friday morning. Official badge check-in will start on Tuesday at 8 AM. Sponsored by the Florida Association of Hispanic Journalists and led by two veteran Latina journalists, this free, in-depth social media training workshop will empower Spanish-language journalists to more effectively leverage the power of Twitter, Facebook and blogging for news gathering, reporting and audience engagement. The entiretraining is being conducted in Spanish and is only for journalists. RSVP on EventBrite is required to attend this session. This intensive half-day session features communications training specifically tailored to help non-profit organizations serving Latino and multicultural communities maximize their use of public relations and social media with a deep focus on social media. Tools like Facebook, Twitter, blogs, video and more will be covered. Lunch and light refreshments will be provided. The free session is only open to non-profits who pre-register. They say the early bird gets the worm so this year, Hispanicize 2014 is going to reward bloggers and journalists who arrive the day before Hispanicize begins, March 31st, with a special Blogger/Journalist Pre-Treat. Co-sponsors The Sherwin Williams Company and Coffee-mate are collaborating with each other and with the Latina Mom Bloggers to whisk as many bloggers and journalists as possible on a truly memorable half day "pre-treat" that will include awesome fun, food, drinks and intimate networking. A new Hispanicize event tradition is born! (This event is only open to journalists and bloggers). Since its first debut at the first Hispanicize event in 2010, the Hispanic Public Relations has been on a roll nationally. The organization now has chapters in Los Angeles, Chicago, Washington, DC, New York City andMiami and that is news that bodes very well for HPRA and the Hispanic market industry. HPRA National is hosting a pre-conference cocktail to bring Hispanic marketers together and celebrate its evolution. Everyone attending the event is welcomed! Startup Angels will host a provocative conversation about technology startups, angel investing and new ways to capitalize on the global entrepreneurship phenomenon. The session will feature Paul Singh, Partner of 500 Startups and now Founder & CEO of Disruption Corporation. The session will include a panel of expert angel investors and startup CEO’s, discussing their experiences and sharing their insights. This event is for accredited investors, and is by invitation only. As Hispanic marketers have evolved their understanding of engaging Latinos through social media, Latina mom bloggers have continued to grow into an increasingly stronger force that today are almost indispensible for mostFortune 1000 brands in the industries of food, CPG, fashion, automotive, financial services, entertainment and more. Put simply, Latina moms comprise the most strategic niche of the $1.4 trillion Hispanic Market and Latina mom bloggers are a big part of how marketers areincreasingly seeking to reach those moms. So who are these Cyber-Mom Influencers? How are brands finding them and partnering with them for success? And what are the strategies and programs that have resonated most with mom bloggers? That and much more will be the subject of this top notch Latina blogger panel. I'm a Latina mama living in San Antonio with my two children. Born and raised in Southern California, now living in Texas. I enjoy cooking,crafting, writing, reading and photography. This session will provide insights on the lessons that several Latino tech entrepreneurs have learned about joining the startup and investment culture of Silicon Valley. In this no holds barred panel led by Jorge Consuegra, Partner of The Fearless Group and a former executive who lead Yahoo! en español, we will explore the honest challenges Latinos face to fully integrate into Silicon Valley as well as opportunities that Latinos have to join the fastest growing sector of the nation’s New Economy. - What can Latino entrepreneurs and investors learn about the entrepreneur mentality of Silicon Valley? - Myth or Reality: Does a diversity barrier exist in Silicon Valley? - How can Latinos integrate into the world of Silicon Valley? What steps can be taken right now? Blogging has taken off. A one-time hobby can now become a full time, profitable content creating passion, but success is predicated on starting strong and sustaining your momentum. If you just started a blog or are strongly leaning to creating one, this session is the primer you’ve been waiting for. Blogging veterans and a copyright lawyer will give you a tour of everything you need to know to get started as a blogger including all the famous do's and don'ts of blogging. Regardless of what you want to use a blog for this is a succinct reality check on what it takes to set up, build and then sustain a blog. California State University, Fullerton (CSUF), Hispanicize Wire, the National Association of Hispanic Journalists (NAHJ) and Florida International University (FIU) will unveil the results of their groundbreaking survey that uncovers Hispanic journalists’ beliefs about their careers and their use of social media and technology. This first annual survey will reveal the challenges and changes that most concern Hispanic journalists today. The insights will bring awareness to these issues and will ultimately help elevate the journalism industry as a whole. Two of social media's hottest speakers, Ted Rubin and Ramon de Leon, are joining forces for the first time to present a special session that demonstrates how every company can benefit enormously by recognizing the fact that social connection is an integral part of all of our lives now. Employees, interns, associates, friends and family members are an incredibly important asset for advocacy, market intelligence, and ideas/input. By helping your employees, and everyone you know, build their brand rather than squelching individuality, you could build an army of very powerful advocates. Most people, when given the opportunity, will advocate for their brands when they feel good about them. The Return on Relationship will be enormous, long lasting and incredibly valuable. Ted and Ramon will share their Passion, Personal experience, and Preferred methods to help you unlock this incredible asset. Toyota didn't become the leading automotive brand for Hispanic consumers by being complacent in its marketing approach. In this special session, Toyota North America will officially unveil a brand new, comprehensive approach to marketing to U.S. Latinos that is sure to become a big part of the marketing buzz of Hispanicize 2014. Latinos own smart phones, go online from a mobile device and use social networking sites at similar—and oftentimes higher—rates than do other groups of Americans. Despite the booming growth of Latino mobile usage, most Hispanic marketers are either not taking advantage of mobile technology or are unsure how to proceed. - How to assess if you need a mobile app for Latino audiences and if you should offer it in one or both languages? - What are the necessary tools needed to develop a great app? In 2013, three million people from 214 countries pledged $480 million to Kickstarter projects, making it one of the top vehicles startups have today to get funded today – and keep ownership. In this session led by Latino Startup Alliance co-founder Ed Martinez we’ll dig deep into the Crowdfunding game and explore how different Latino tech startups can take advantage of this innovative funding model, how to structure your startup’s pitch and much more! - What kinds of projects are strong candidates for crowdfunding? - What are the biggest do’s and don’ts of crowdfunding? - How do you know your venture is right for crowdfunding? - What are the ingredients of a good crowd funding campaign? - What are the true costs of a crowdfunding project? - What are the differences between the platforms? Are they all the same? Brands have quickly capitalized on the general market Social TV over the past year, shining the spotlight on the most nimble and creative content and engagement. In 2014, there is an even greater opportunity for brands to utilize Social TV surrounding the highly-rated and talked about Hispanic shows like Univision’s Premios Juventud, novelas such as Por Que el Amor Manda; Telemundo’s La Voz Kids, Premios Billboard, Mira Quien Baila, etc. In this panel session moderated by Nick Bianchi, Director of Social Media at BodenPR, attendees will learn how to help prepare and launch brands into Hispanic Social TV, to organically and effectively expand reach and generate revenue. Attendees will discover how brands can fully capitalize on Hispanic Social TV and how Hispanic Social TV will surpass general market in the near future. - Tactics to interject Social TV programing through engagement - to help expand reach and enhance TV ratings. The Quiet Riot and Ozzy Osbourne bassist to share insights on his musical journey from playing local gigs in Miami to touring and recording with legendary rock bands. Hispanicize today announced the first artist of the “Exclusive Artist Q&A “ series, which is to become a staple during the annual Latino trends event. Rockstar bassist Rudy Sarzo will debut the first Q&A on Tuesday, April 1st at 3pm ET at Intercontinental Hotel, Miami, FL. Te Para Tres host, Pili Montilla, and Musician Interviews host/guitarist Anu Gunn, will lead the conversation. The intimate session will explore Sarzo’s mark in the history of rock, his contributions in the English-speaking music industry, as well his role in the Latin music industry for over 20 years. As a member of Ozzy Osbourne’s band Sarzo has toured the world. As a member of Quiet Riot, Rudy recorded the multi-platinum albums “Metal Health”, the first Heavy Metal debut to reach #1 on the Billboard charts, and as a member of Whitesnake, Rudy recorded the multi-platinum album “Slip of the Tongue”. Rudy Sarzo’s recordings with all of these artists combined has sold over 30 million copies. Rudy is also the author of the book “Off The Rails: Aboard the Crazy Train in the Blizzard of Ozz,” an insight into the late great guitar virtuoso Randy Rhoads’ life. Today, Rudy Sarzo is touring the world participating in various projects, including Queensrÿche, Animetal USA and Rock n’ Roll Fantasy Camp. The rules of journalism are being rewritten by social media age and that means that for journalists it’s vital to master the art of G.D.E. : Gathering, Distributing and Engaging. In this powerful session three of the most respected Hispanic journalists in the country will open their playbooks to show you how to leverage different social media platforms to improve your story-telling skills and vastly improve your stories’ reach. Hispanic millennials are one of the most compelling, dynamic and often misunderstood segments within the growing Hispanic market. In this in-depth session, Hispanicize attendees will get a “first look” opportunity at the results of nationwide research on Hispanic Millennials conducted jointly by cross-cultural advertising agency Sensis and ThinkNow research. The two-part session will begin with a summary overview of the “Hispanic Millennial Report” followed by a brief panel discussion by leading Hispanic millennial brands and marketers on theimplications of the research. The Latina Mom Bloggers network and The Center for Hispanic Marketing Communication at Florida State University will unveil the results of their first annual State of Latino Blogging Survey. The session will help identify attitudes toward blogging as a business and opportunities currently influencing blogging as a profession among Latinos. With the growing presence of Latino and multicultural social media influencers, the research aims to decipher key trends relating to whybloggers are engaged in content production, what content areas are relevant, what motivates these entrepreneurs and what are some of their key concerns as they continue developing their online media platforms as a business in manycases. Let’s say you’ve got a really good idea. And let’s say you’ve got a really good investor behind your good idea. Now the challenge is to market your idea effectively to build a profitable business. In this panel session, led by Claudia Gioia and Lily Garcia, you’ll learn how to develop a marketing strategy to capture the 52 million strong Latinos living in the United States today. From learning the art of self-promotion to incorporating thoughtful design into your product or service, you will make your business culturally relevant to a segment of the population that is becoming increasingly more educated and prosperous. Are Latino startups different and if so how? CEO - Chief Education Officer, Mivista Consulting, Inc.
Lifestyle, entertainment and healthy living are top of mind among many of today's top Latino lifestyle bloggers. In this session you'll learn how some of the nation's most active bloggers are creating content about lifestyle and healthy living, two of the most popular blogger categories in the Hispanic blogosphere. Learn about the best Google tools to leverage the web with actionable, capacity-building content. This session will cover everything from Google Keyword Tools, various Google products, from Google+ for brands and bloggers to platforms to build free mobile sites. This one hour session with Google will be jam packed with everything you need to know to maximize your online presence. Grow and engage your audience and learn how to make the Google tools you are already using work for you. The Total Market Approach, the World Cup, Hispanic Social TV, the growing strength of Latino bloggers, the emergence of media tailored toHispanic Millenials… yes, there’s a lot of things Hispanic marketers need to keep their pulse on in 2014. In this high profile marketing session you’ll hear from four of the nation’s top Hispanic brand marketing executives as they tackle these and other pressing questions that everyone in the Hispanic market industry willgrapple with this year. - What should we expect to see in the marketing industry for the World Cup and how will hosting it inside Latin America impact the U.S. Hispanic market? - Who are the Latino trend-setters that brands most admire in music, film and culture? - How is the Total Market debate playing out among different brands? - What do top brands say about the way they’re approaching marketing to Hispanic Millenials? Incubators and accelerators are launching all over the globe daily launching all of over the world. You also have the first U.S. Latino accelerator in San Jose, CA – Manos. What are they? How can they be of help with your startup venture? In addition, there are all types funding available, new venture capitalists, and many angel investors being created with new wealth …so many terms. What do the all mean? In this panel session led by Del Medina President of Latino Startup Alliance, you will hear from different Accelerators, VCs, and Incubators. What’s the difference between them and what are they looking for. In addition, come listen to the first set of 2014 LSA Surveys about Latino Startups and funding. This will become an annual update at Hispanicize. - How are Latino tech entrepreneurs doing? - What are some best practices and tips to share? - What not to do when applying for a program? - What are they doing different in 2014 to attract Latino entrepreneurs? By attending the session, you will not only be the first to be eligible to join the network, but you’ll have the chance to win fun prizes throughout the session. The interactive Q&A session will discuss the importance of oral health to your families, and each attendee will receive a Crest “family suite” of products for all those big and small at home. Ana Patricia Gonzalez, co-host of Despierta America, will be moderating the session and be available for one-on-ones with bloggers in attendance. Building on the Hispanicize event platform’s position as the event that formally launches big Hispanic brand strategies and ideas, Coca-Cola will officially unveil its U.S. Hispanic marketing strategy and other surprises for the World Cup at a special session that is not to be missed. Latinas Got the Power: Now What? These are arguably heady times for Latinas. Despite still facing many hurdles to overcome, Latinas are making impressive strides with unprecedented empowerment in their careers, access to education, social media, journalism and marketing. Anchored by impressive new research by Nielsen, this blue ribbon panel of researchers, cultural, educational and brand leaders will take an honest inventory of where Latinas are in 2014 and answer the biggest question of all: What's next for the empowered Latinas? As the ecosystem of Latinos in technology has continued to mature, a growing number of high profile writers and platforms are increasingly devoting their coverage to all things Latino and multicultural tech. In this session, we'll meet some of those top tech voices and you'll hear about how to collaborate with them. · Who are the hottest Latino tech startups? · How do Latino tech startups differ from mainstream tech startups? · How Latino tech startups pioneer trends and influence the mainstream? · How brands are finding and partnering with Latino tech startups? Glue, paint, glittery sweat - and a lot of crafty networking helped four of the most influential DIY experts in the nation turn their passion for DIY into full-time gigs. In this session, four popular DIY stars share their stories of breaking into the business, the benefit of incorporating craft, fashion DIY, home decor tutorials in your blog content, what makes a good tutorial, ideation, tips for great graphics that will get picked up by editors from popular sites, virality tips, and more. Many lifestyle bloggers and sites have realized the value of adding DIY, crafts, fashion hacks to their agenda. Craft tutorials, with the right graphic and idea, can result in major page views. It's a very competitive industry and these four panelists have managed to stay at the top of the game, - not only in the Latino world, but in the mainstream DIY universe. From hacking a hoodie to refurbishing a dinette to choosing the right color story for a flower arrangement - they have covered it all! We all know that YouTube is the second largest search engine in the world. Having a strong video presence is crucial for anyone that wants to build a brand nowadays. Let's learn the art of Vlogging. We'll discuss the techniques for your on-camera presence, producing a good video as well as building your channel and reaching the right audience. Interact with your audience, and build a community around your content on YouTube. Create viewer-centric content, engage with your audience through social features on the platform, and develop relationships with top contributors. Spur conversation. Create relevant content that generates conversation among your community. Our annual “Rules of Engagement” session will help past and first-time attendees learn the latest best practices of the Latino Brand-Blogger relationships with a panel of experts from representing agencies, brands and blogger networks. Hear our 2014 update on recent case studies of successful brand-blogger campaigns and the nuances to lookout for. Learn about which types of brands are investing more in the Latino blogosphere, their expectations, requests and metrics. Learn the differences between working with individual bloggers versus blogger networks. Sponsored by Strayer University, the first annual Latino Startup of the Year competition concludes with a four-way competition featuring national finalists: Crowdismo, LAM, Interesante and Oye!. The four Latino startups will compete for a grand prize that includes online university credits worth thousands of dollars from Strayer Univeristy, a package of multimedia press releases worth $2,500 from Hispanicize Wire and the right to be named the 2014 Latino Startup of the Year. Join us every day at 4pm by the "Artist on the Rise" stage for a Musical Happy Hour. Drinks and music on us, fun and excitement for all. Don't miss out on the fun! Kick off Hispanicize in style and stop by Target’s Opening Reception in the Grand Ballroom. The event will feature a high energy fashion show of Target’s newest exclusive collection, Ámbar. See styles before they even hit stores, sip on summer inspired cocktails, mingle with Latin style expert Rodner Figueroa, and dance the night away with celebrity DJ Juan Magán. Don’t forget to share all the fun by using #MusicMeetsStyle. It always plays out the same way. A new Census comes out and media companies rush to create special“Latino” content without truly understanding how to provide culturally-relevant content to a diverse audience with a diffuse identity. Because Latinos in America are already mainstream, journalists from different swaths of mainstream media understand it needs to be undertaken in a different way. In this session, some of the Latinos in leading mainstream media outlets talk about the trends taking shape at their organizations as well as their take on where things are going into 2015 and beyond. • What news organizations are doing now to connect with a burgeoning demographic. • What the next generation Hispanic journalist must know. • The stories the audience is asking to be told. • How these journalists navigated mainstream media to get where they are now and how they’re contributing to a new understanding of Latino coverage. Nearly three years after Walmart eliminated its multicultural marketing team in order to embrace a new, "Total Market" approach that called for all employees to treat multicultural marketing as a company-wide business priority, the debate about this approach rages and evolves. Today some research shows that more than 50 percent of all advertisers use some form of the Total Market strategy and those figures are bound to increase. Join this session as a group of top Hispanic brands and a Hispanic agency discuss the impact this Total Market approach is having on the industry, what some of the early lessons are, the hybrid forms this strategy is taking at different companies and what the future holds for this approach. Most marketers know mobile is important, but spend most of their time trying to understand how to harness the technology—rather than understanding how consumers live with their phones. In this panel, we will start by hearing from some real people: Smartphone superusers going about their lives with their number one accessories. Join Edward James Olmos and a panel of experts as they discuss what’s going on for Latinos within the Media. When it comes to entertainment, news, and policy discussions – How are we portrayed, but also how are we changing things behind the scenes? Panelists will cover the current landscape and challenges, but also analyze what’s changing and strategies for meeting the challenges. In the midst of a digital and social media age that already has FOREVER altered the way people consume news and information, journalists from all spheres of traditional media – TV, radio, print (especially print) - are facing fears of lay offs, furlough and forcible part-time employment. In this special, half day boot camp for journalists loosely based on Manny Ruiz’s forthcoming book “A Journalist’s Guide to Media Entrepreneurship”, a parade of Latino media entrepreneurs will unpack practical insights, lessons and advice that will arm all journalists to tap into their inner entrepreneur. Grammy and multi-Latin Grammy winner singer/songwriter/composer, Carlos Vives to be honored with the Latinovator Award at Hispanicize 2014 luncheon on Thursday, April 3rd. In addition, Vives’ will be making major announcements at an exclusive press conference on Friday, April 4th. In addition to being honored with a Latinovator Award, Carlos Vives will be collaborating with Coca-Cola in a special session on Wednesday, April 2nd, and will also hold a press conference at Hispanicize Event on Friday, April 4th, announcing the launch of his new album “Mas + Corazon Profundo,” which will be released on May 13th. Vives’ will also premier a new music video for the #1 hit single “El Mar De Sus Ojos” Feat. ChocQuibTown. Oh, la, la, are Latinas into fashion and beauty! Call them vain or just ultra self-conscious Latinas represent one of the sweetest hot spots for beauty and fashion brands. Join us for a special session featuring four of the nation’s best Latina fashion and beauty bloggers as they discuss what’s trending among Latinas, effective case studies of the past year and how to collaborate with fashion bloggers. Latinos have quickly become the largest segment of moviegoers in the country. Behind that audience lies talent that is quickly trying to find ways to get noticed, get funded and obtain greater opportunities. Whether through music videos, contests, social media campaigns - The opportunity of recruiting filmmaking talent to a brand or collaborate with agencies has never been more timely. Yet, there’s still more work to be done in getting independent filmmakers to a corporations radar. Meet these companies who are not only looking for talent but finding unique ways of getting them sponsored and employed. Implementing digital strategies and tactics in any marketing communications program has become a must. This is mainly due to the fact that most corporations and their target audiences occupy a space in the digital world, even if their business or livelihood is not directly related to it. In this panel session led by Michael Bassik, honoree of Ad Age's 40 Under 40, and Eric Díaz, founder of Nativa, you will learn how to set realistic objectives for your digital strategies and, most importantly, how to measure your success without losing sight of the bigger “marketing communications” picture. Soccer has always been one of the most popular vehicles marketers use to engage Latinos but even though the game remains the same, the tools and tricks marketers have at their disposal today have greatly increased. In this year of the World Cup, a year that many expect will result in the first full scale digital World Cup, a top notch panel of soccer marketing and media insiderswill look at Latinos’ most popular sport, its historical role in marketing and its evolution. Last year the Hispanicize event introduced attendees to some of the top U.S. Hispanic YouTube celebrities, who are known for creating viral videos. This year, some of those panelists are returning for a deep dive into the actual formulas behind great viral videos and how brands can tap into viral content for their own benefit. In this session, you'll gain a greater understanding of the value of branded viral videos, how to incorporate branding into viral videos, how to measure the success of a branded viral video and the different levels of opportunity for branded video content across multiple social mediums. - Analyze past case studies of viral videos in the U.S. Hispanic space to show what types of results were generated and how brands have measured the success of leveraging these concepts. - Review how frequently viral videos are used in the U.S. Hispanic marketing space vs the "general market." - Discuss NEW micro-video platforms such as Vine and Instagram to analyze how these platforms will change the scope of short-form viral video content. - Review when and how video content on YouTube garners traffic and impressions versus their most recent and biggest competitor for video-hosted content, Facebook. What do The White House, US Department of Education, and the AARP have in common? They're disrupting the way marketing and engagement gets done by challenging old stereotypes about both Hispanic men and women. Giovanni Rodriguez -- a regular contributor to Forbes and advisor to government, NGOs and leaders in the Fortune 500 -- presents emerging best practices in Latino marketing in this highly engaging and interactive session. Starbucks is about building community and bringing people together. Inspired by the traditional flan dessert, Starbucks introduced Caramel Flan Latte to the community in a culturally relevant way by creating “Noches Culturales” – Cultural Nights – a series of live acoustic concerts in several major U.S. cities featuring local musicians from the Hispanic community to bring live music and dancing inside a Starbucks. In partnership with Edelman Multicultural, Starbucks dedicated Hispanic PR team of “cultural consultants,” and Pili Montilla, host for Noches Culturales events, Starbucks successfully brought the community together to enjoy music, celebrate their cultural heritage and support local artists while sampling an exclusive tasting of Starbucks Caramel Flan Latte. Edelman’s Starbucks Caramel Flan Latte Hispanic program is an award-winning public relations campaign having received industry recognition and commendation by PRWeek Diversity & Distinction in PR Awards 2013 for leveraging Starbucks employee resource group as a channel to broaden product lines to engage new and diverse groups along with creating unique, culturally relevant, in-store sampling experiences that led to an awareness boost for Starbucks Caramel Flan Latte which put Edelman Multicultural and Starbucks on the radar of the Latino community groups involved in the program. Panelists include Willy Villarreal (Vice President, Edelman Multicultural), Pili Montilla (three-time Emmy nominee, TV personality and producer) and surprise musical guest! 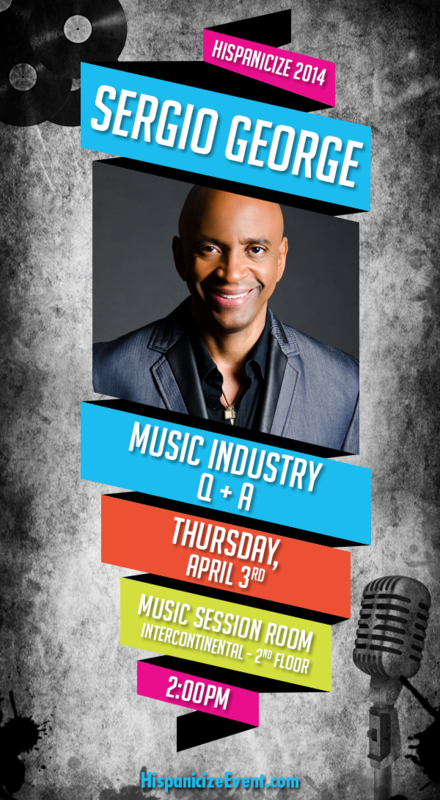 Eleven time Grammy® Award winning producer Sergio George will participate in an exclusive Artist Q&A on Thursday, April 3rd at the 5th anniversary of Hispanicize Event in Miami. Sergio George has cemented an international reputation as a leading producer of Latin music. During the course of his remarkable career, George, who’s name appears on over 200 million albums, has worked with talents such as Marc Anthony, India, Christina Aguilera, Tito Nieves, Víctor Manuelle, Tito Puente, Orquesta de La Luz de Japón, and Jennifer López, among others. Today, he serves as founder and CEO of Top Stop Music, the independent record label which launched the career of Prince Royce and keeps pumping out musical stars such as Leslie Grace, as well as great music with the compilation SALSA GIANTS which unites biggest stars of tropical music uner one project.The panel will be conducted by Robert Somoza, Army Social where he will discuss the legendary producer’s career, achievents and the catalyst of the rebirth of tropical music. “Sergio George is one of the most prolific arrangers/producers and songwriters in Latin Music to date. He has been responsible for some of the biggest hits that we hear on the radio and has turned many megastars' hits into classics," said Hispanicize Music Director, Vanessa James we are thrilled to welcome Sergio this year and continue to expand the Hispanicize Music platform." Even though Facebook is the largest social media network for Hispanics with more than 23 million U.S. Latinos logging on and accounting for more than 1.1 billion comments and 5.83 billion likes monthly, Facebook is also the most untapped and misunderstood platform for USH brands. In this session we’ll examine the most important Facebook metric of all, the “talking about this” number, and we’ll look at how these metrics can be raised through a combination of daily total likes, comments and page shares. Even as the major Hispanic TV networks continue to make viewership gains, things are evolving at the major networks with new programming experiments, “Hispanicized” shows, Latino social TV and much more. Join senior executives from Telemundo, Univision and Vme TV as they discuss lessons from the past year in Hispanic TV, examine what's trending and preview what’s soon to launch on their networks. Everybody knows SEO is a critical component to driving traffic but until recently SEO has been harder to figure out for Hispanic-targeted and Spanish-language Web sites in particular. A panel of SEO experts will help you discover the keys to growing your English, Bilingual, and Spanish-language web site’s traffic in an organic and exponential way that will help you drive targeted traffic, increase conversions, and build a loyal community by tapping into the Spanish-preferred and Spanish-dominant U.S. Hispanic Market. If you already have Spanish-language Web properties, it’s time to optimize them to increase organic traffic and seize new revenues from the Hispanic market. Then, along with the cultural relevant English-language Web properties, you’ll be well-positioned to reach the “entire” spectrum of the Hispanic market. • Tips to executing a cost-effective Hispanic SEO campaign that can help you connect with the nation’s fastest growing community and expand your business. • Key considerations and best practices for developing and implementing a Hispanic SEO strategy for your Web properties. Hispanic Print Media is alive and well, trending positively while many general media print outlets are losing money, market share or have gone out of business. Ricardo Hurtado and these exceptional panelists lead you through the media maze to discover how and why the Hispanic Print Media is still so powerful. Hispanic print has proven to be a successful vehicle for advertising. In fact in Chicago, New York and Miami, 89% of Latinos read at least one newspaper on a weekly basis. Understanding the two opposite industry trends could be a challenge, especially with all the positive buzz about today’s digital media. In emerging market cities such as Philadelphia, Pennsylvania and Wilmington, Delaware; 69% of the Latinos read at least two newspapers per week. Hispanic Print Media is a cultural tradition generations old and generations strong. It is the proven preferred way to receive news, The community has a deeply held desire to hold their newspaper with one hand and drink coffee with the other. Latinovator Lunch with Sheila E.
Whether you’re a blogger or a basketball player, having a good offense is always the best defense. That’s why protecting your intellectual property is critical to successful content creation. Hear from experienced lawyers about pitfalls to avoid and best practices for defending your brand, likeness, and works while capitalizing on everything that’s great about them. (Presented by Thomas & LoCicero PL, the official legal partner for Hispanicize 2014). - How to use social media without getting sued. First it was salsa, then tortillas, and now it’s guacamole! With an estimated 79 million pounds of avocados consumed as the oh-so-delicious guacamole during the 2014 Big Game, it is clear that traditional Latin foods are here to stay, are shaping the way the new America eats and have become a staple in pantries around the country. Whether you are a top Americana food brand or a specialty food company looking to appeal to the constantly evolving American palate, learn from top industry leaders about new food trends, what other corporations, chefs, and even food bloggers are doing to capitalize on the food revolution, and what ingredients make for a successful campaign when reaching the U.S Hispanic consumer. After conducting extensive qualitative research, Navarro Discount Pharmacy, the largest Hispanic-owneddrugstore in the US with 33 stores in South Florida, launched Vida Mía (My Life), the first private label brand of products in the U.S. targeting Hispanics across a wide range of categories including over-the-counter, household, beauty, food, body and baby. The labels on these products include thousands of product SKUs in both English and Spanish, making the Vida Mía private label brand a true reflection of the Hispanic culture and giving Navarro a unique channel to connect with Hispanics from numerous Spanish-speaking countries. Navarro sells Vida Mía products in their stores and on a wholesale basis throughout the US, Latin America and the Caribbean. In this session you will learn why Navarro has received numerous private label and marketing awards over the last two years recognizing the various Vida Mía products and thetrend that Navarro seized upon in developing a highly successful private label brand. - Mi Casa (Home) – Household and kitchen items, coffee cups, paper goods. - Mi Cuerpo (Body) – Soap, shampoo and lotions. - Mi Salud (Health) - Over-the-counter (OTC) health items and equipment. - Mi Bebe (Baby) – Diapers and baby items. - Mi Belleza (Beauty) – Make up, cosmetics and beauty accessories. - Mi Sabor (Taste) - Coffee, plantain chips, cookies, rice, sugar, other food. Loren Medina, Founder, Digital Girl Inc. This will be an unforgettable night of music, Live performances by 3 powerful Latina artists, tons of dancing, and celebrating Hispanicize Event's 5 year Anniversary. Get your clubbing dress, heels, slacks and dress shoes out--it's time to party, MIAMI STYLE....Cheers!